Love my bracelet and my two granddaughters live out of state, so when I look at and touch their birthstones pearls, I smile. Beautifully made bracelet. I purchased it for my daughter and I know she will absolutely love it. Beautiful necklace I am proud to give as a gift. 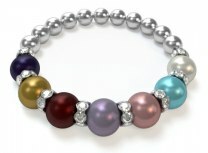 I have had my grandmother’s bracelet for many years and have added pearls throughout the years. Recently, I had one added and it was mistakenly placed in the wrong place. I called the company and explained the error. The young man I spoke with was very helpful and apologetic. I returned the bracelet and it was fixed and returned quickly. I love my bracelet and the little people it represents. Thank you! I was pleasantly surprised at how beautiful this bracelet was at such a good price. Excellent value for the money. 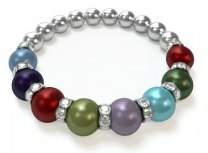 I loved my Mother's bracelet with 6 pearls. 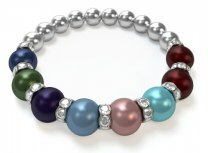 I have two more grandchildren and love my bracelet even more with the added two pearls. This is my second Mother's Bracelet, and they are just beautiful when worn together or individually. I love their significance! Thank you! I purchased one of these for myself several years ago and just love it, so now bought one for my daughter. The green stones are she and her husband (August) the Garnet are her twin sons (January) and the Blue Zircon (December) is her daughter. Because of the duplicate months the stones are beautifully placed. Mine is the same except the outer stones are Emerald (May) for my twin granddaughters. So our bracelets will be almost identical. Love it! Just love my Nana bracelet! 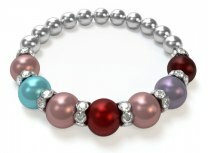 It’s so pretty and the colored pearls are beautiful!